We are extremely excited by the response to our brand new Martial Arts Summer Program! 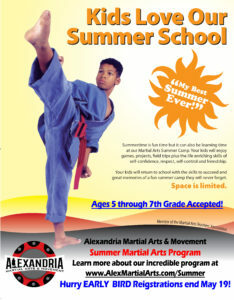 We are offering 12 weeks of incredible martial arts training, activities, and life-skill building fun all summer long! Not only will it be a great opportunity for your elementary school student, but also your middle school student through the 7th grade. There is no aging out of this program! You won’t have to bring your your elementary and middle schooler to different programs, this one will encompass them both! In addition, we have leadership development material, life-skill enrichment, and confidence building curriculum built right into every day of the program. Your son or daughter will not be spending the entire summer playing video games, sitting idle, and getting into trouble. They will be learning valuable skills to make them better students and better people all summer. Our Early Bird Registration is limited to the first 20 spots and Early Bird registration closes on May 19. Hurry, you only have a few days left! Get more information about our Summer Program.